Being the Genie Princess is no small feat! I've been busy making my rounds all over the world, welcoming new passengers to the Magical Flying Carpet, helping them get their post right and simply making new friends. I bet the Genie King must be exhausted too from all the flying around he's been doing with me! Anyway, one of my new friends that I recently made acquaintance through the Magic Carpet Ride is Lady Java. She too happens to have some adorable cats of her own and we became friends when we discovered that we share the common love for these fun & fluffy creatures. Lady Java has tagged me on a very easy and interesting tag and it's called "What's On Your Desktop". Open a graphics program (like Picture Manager, Paint, or Photoshop) and do a Paste (CTRL + V). If you wish, you can “edit” the image, before saving it. Post the picture in your blog. You can also give a short explanation on the look of your desktop just below it if you want. You can explain why you preferred such look or why is it full of icons. Things like that. Tag five of your friends and ask them to give you a Free View of their desktop as well. People who have already pimped their desktop: Francine of La Place de Cherie Chez Francine Bloggishi Unchained Melody LadyJava's Lounge Mariuca Revellian Dot ComDesktop Emila’s Illustrated Blog Spiff, The Spaceman Rolando Brown Baron Ordinary Folk The Kat House Trinity West Virginia Blogger Promthep MeAndMyDrum Elena's Photos MAX Amel's Realm Choc Mint Girl Madhur Kapoor Mother's Home! Consuela Aaron Cook Dot Com Vincent Chow I Was Born2Cree8 Janice Ng TwistedSister Samir Bharadwaj Diamondssaphire WaterLearner Jean Chia Zubli Zainordin Rita Mumblings Adrian add yours here after doing this tag. Now, let me take a peek at your desktop background! When you're done with this meme, don't forget to leave a comment on this post so I'd know to add you to my list here. Do I really have to show all the highly illegal content of my desktop? Yes, we love cats. Can't enough of them..hehe.. He he he,LOL! Can I clean up a little first, or should I show how it really is? BTW, I think I see firefox tabs open on your navigation bar! Very cool! In Tools, addons, add new extensions you can find the stumble toolbar, and sparky the alexa toolbar. Sparky took my Alexa rating from 350,000 or so down to 139,000 in no time! If you have any problems with firefox, please ask me or the BrownBaron for some help! Thanks for adding me and this was such an easy meme to do! Bobby, of course you can't clean up ur desktop first, that's a no no LOL! Yes, your eyes are not deceiving you, that is indeed Firefox u see! :) Oh what a cute name for the Alexa toolbar, Sparky!! I'm sure I'lll be running into some probs with my Firefox, and it's good to know that I can count on 2 great bloggers to help me out, thanks Bobby! GP! Thanks for the mention and more importantly thanks for not taggin' me LOL Yeah it's tough work being a genie and flying all over the place picking up riders...btw..I've added a couple too so you can come by and pick em up if you haven't already done so! Looks simple enough, so I'll get it up soon with no modifications whatsoever to my desktop image. You'll get the image as it is ... Don't laugh too much at it, k? LOL! Spiff thanks you for the tag. Hola Spiff! Of course I believe in coincidences! He he, I know Spiff will do this one asap since he isn't as lazy as his other friend "the laziest blogger" LOL! And yeah, it's too darn easy for words, so you'll be able to get it out in 10 minutes perhaps? Have fun Spiff! There's your Bobby tip of the day! Marzie puts the "fox" in firefox:)LOL! I did this one, too! Fun. aloha marzie!! are those pc games at the center pile? hehe.. Cool! Will do it real soon! Thanks for the tag! Done! Please add me to the list! HI marzie,u r dell supporter ya? hehe..u really have bunch of icon in ur desktop..i think it is a bit messy for me..
Hey Marzie, Spiff has done his tag already, quick isn't he ... LOL! hi Marzie,are you dell supporter? Marzie, you have so many icons(50+++) on your deskstop. Cool. Mine only 19icons only. Uncle Sam! Yeah lor, and now got more cause I just added several new icons last nite! U only 19 mah? He he, must be neat unlike mine. What's the difference between Vista and XP???? Marzie... 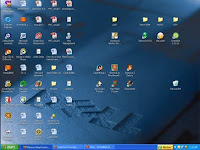 Your desktop is also neat with lots of icon of course.. haha..
Oh! That looks like FUN! Hi Marzie, Vista the graphics is better only(like Apple) but booting up is slow and need 2gb RAM to support it. There are still some bugs. Another something for me Jackie? WOW,must go and check it out now.... Have a good one dear! Thanks for visiting my blog :). I hope you keep visiting :). 3bWOxw Your blog is great. Articles is interesting! cant believe you did this 9 months ago Marzie! Jeas these memes get around a bit dont they!? Hey i noticed you have a cake mania and icecream tycoon icon. I love those games! Any games like that im addicted to. Hola Tina!! Wow, now that u mention it, I too can't believe it's been 9 months since I did this meme ha ha!! nowadays, i got macro pictures of flowers that i took from the garden. This was a fun tag GP!! My desktop ada gambar Jay Chou. Nak tukar la kejap lagi! Lol!! Let's see, I have 8 games icons for me, 14 for C, 10 random folders, 4 torrent files, 8 apps shortcut and recycle bin on my desktop. Lol!!! Alamak, lupa nak tukar desktop wallpaper lah! Hehe..
wahaha siap describe lagi tuh!